• Allen Iverson will debut in his return to the 76ers against the team he was traded to in the 2006-07 season. In return for Iverson, the Nuggets sent the 76ers Andre Miller, Joe Smith and two 2007 first-round draft picks (the 76ers used those picks to select Daequan Cook and Petteri Koponen). Help couldn't come at a better time for the 76ers -- they've lost nine straight and are 2-13 in their past 15. • Iverson, who is expected to start Monday, and Andre Iguodala started 162 games together for the Sixers from 2004 to 2006, winning as many as they lost (81-81). Iguodala averaged 7.5 field goal attempts and 10.6 points per game starting alongside Iverson. His averages since then: 14.7 attempts and 19.4 points per game. The Nuggets posted a 77-58 (.570) record in the games that Iverson played for them, compared to a 68-31 (.687) mark since trading Iverson to the Pistons in November 2008. In The Race For Eighth? 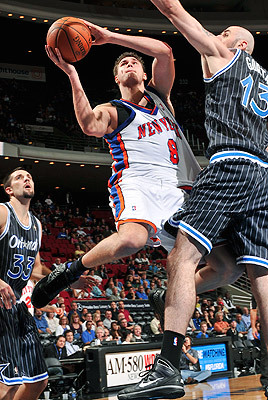 Danilo Gallinari and the Knicks have won three of their past four. Is a run at the playoffs possible? Is A.I. The Answer For Sixers? Allen Iverson makes his debut with the 76ers on Monday, and we're all wondering whether he can recapture his lost glory now that he is reunited with his former franchise. The answer (no pun intended) all depends on your expectations. If you're thinking Iverson is going to put the Sixers on his back and carry them into the playoffs, you're about half a decade too late. But if you're asking whether Iverson can be a productive starter, fit in with the Sixers' lineup and provide enough of a bridge to Lou Williams' return to keep the Sixers on the fringes of the chase for No. 8 in the East, I'll offer an emphatic "yes." Iverson's legacy is being reconsidered in light of his recent failures in Memphis and Detroit, and his detractors certainly have some valid points. He's played for exactly one team that won more than 50 games in a season, he was never able to coexist successfully with another good player, and his lone MVP was one of the most ridiculous votes in league annals. It's a Beamon-esque leap from that point, however, to one that suggests signing him to a one-year deal for the minimum can somehow backfire. Sure, Iverson has lost some of his mojo, and perhaps that mojo wasn't quite as effective as many thought at the time. But the Sixers didn't use any important capital to acquire Iverson, signing him to a one-year deal for the league minimum. Remember, our comparison here is promoting somebody from the D-League. Since they didn't trade Chauncey Billups for him like Detroit did, nor make him their primary free-agent signing like Memphis did, the potential damage is far less.